You already bought a sports franchise and a McLaren M6. Now you have $78 million of disposable income lying around and are looking for the ultimate luxury item – U.S. Submarines has a Phoenix 1000 65 meter, personal luxury submarine awaiting a buyer. Capable of 18 knots at the surface and 10 knots at its cruising depth of 305 meters, this 1500 ton monster might possibly be the coolest luxury good I have ever seen. Just imagine – you’ve been cruising the south pacific, doing some deep-sea exploration, then you pull into the yacht club for dinner. Pretty sweet. The specs sheet claims over 5000 sq ft of interior space and 30 days of oxygen capacity. 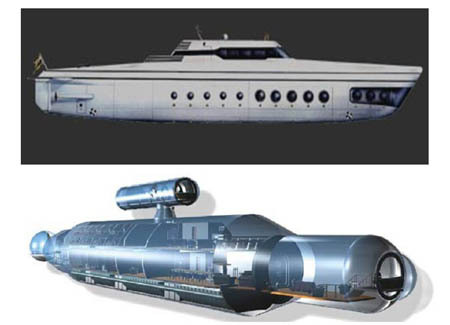 I personally think the docking collar for the personal “minisub for underseas exploration” is the best amenity (Jules Verne would prefer the viewing saloon to watch for giant squid). The company suggests that you could keep a small car in the saloon, but I’m not sure why. Maybe they can retrofit the hatch so you can drive the McLaren out of it onto the dock. is there any possible way i can borrow this for a day… i wanna pass science! Now, if they can build the ship from the TV Show SeaQuest, I’m all for it. Solution to land shortage problems.. People should live in submarines instead of houses since our earth consists more water on the surface rather than land.